The Brussels weather hasn’t been kind recently, so it’s a good time to get away for a weekend to some place south; some place warmer. One of my favorite places to escape, especially since my daughter is spending the year there, is the Spanish capital, Madrid. It’s easy to get to Madrid from Belgium. In just over two hours, you can fly direct from Brussels International Airport, or do the cheap flight thing, from Charleroi, (a.k.a. Brussels South Airport). When visiting Madrid, most people make a beeline for the main sights, such as the Prado Museum (where it would be easy to spend an entire 48 hours) and the Royal Palace. You are welcome to follow the traditional tourist path but, if you prefer, here is my perfect weekend in the hometown of 3.3 million people. One place you should visit is a place most people just pass through, without even noticing. I’m referring to the Atocha Renfre, the city’s south train station. It opened back in 1851 and was the city’s first port of call for trains. The amazing thing is it’s a big green house. Other than the exotic, tropical plants, such as banana trees, there is a pond with well over a hundred terrapins swimming around. 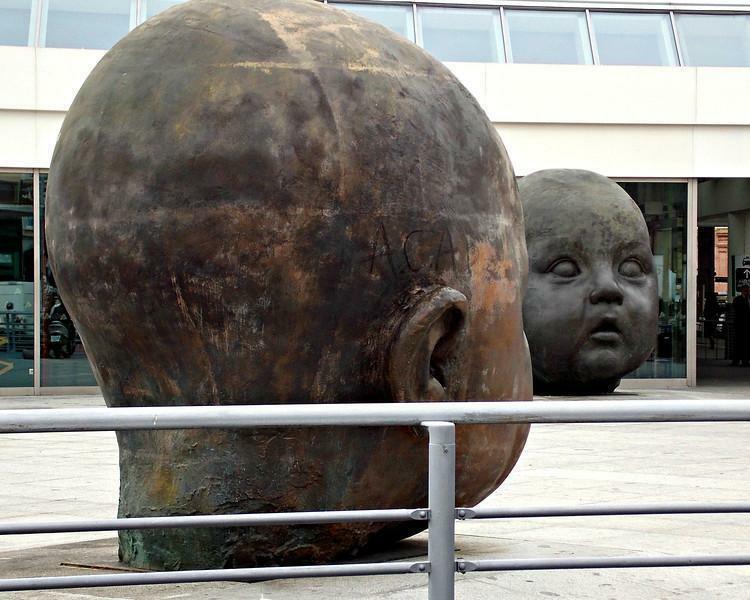 When you leave the station, head out the back exit and check out the two sculptures of the gigantic baby doll heads. I have never seen anything like this before, anywhere. They’re quite amazing and make a nice backdrop for a photo. I recommend you then catch the Metro at Atocha Renfre, and take yourself to the Puerto del Sol stop. This is the heartbeat of the city, so have a quick look around. Have your photo taken with the statue of the bear climbing the tree, the symbol of the city. I warn you though; don’t take pictures of the people dressed as Disney characters, because they will insist you pay them. To me, the more interesting square is just a short walk from Sol. Head to Plaza de Santa Ana, which is about a ten minute walk away. This square is full of pleasant cafés and restaurants, as well as the Teatro Español, which was built in 1745. Being a literary buff, my favorite part of the square is the statue of the Spanish poet and dramatist Federico Garcia Lorca. He was murdered when he was 38 years old, by Franco’s Nationalists, during Spain’s Civil War. When you pass by a bookstore, and there are many in the city selling books in English, such as J & J Books (at Calle del Espíritu Santo, 47) or one of the many Casa del Libro chain bookstores, pick up a copy of one of Lorca’s books of poetry to read while on the metro or in a café. With late morning turning into early afternoon, it’s time to think about sports. You will never know Madrid, or the people of the city, without experiencing their number one sport – soccer (Or football as it’s known outside of North America). Sure, they like beating up bulls too, but this sport is tops. With three top division teams in Madrid, there’s an excellent chance one of them will be playing at home and, most likely, at a convenient time. The most popular team in Spain, not to mention one of the most famous in the world, is Real Madrid. 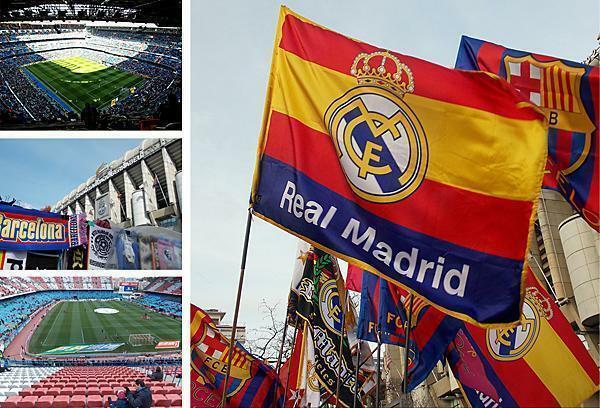 Real plays at the 85,000 seat Santiago Bernabeu Stadium and, if you are lucky enough to be there for El Classico, when they play arch rivals Barcelona, then you will witness one of the greatest sporting rivalries on the planet. Catch a Soccer (football) game in Madrid. After the game, if it’s not too late (games may start at 4pm or as late as 9pm), it’s time to eat. There’s no shortage of decent restaurants in Madrid and you should try some Spanish food, especially if you didn’t get your fill at the San Miguel Market. Stroll down the Gran Via, check out some of the stores, and find a place to eat. Most importantly, look up! The Gran Via has an amazing mixture of early 20th century architecture. Also known as the Spanish Broadway, due to its many theaters, this strip has buildings that will remind you of places such as Manhattan and Paris. 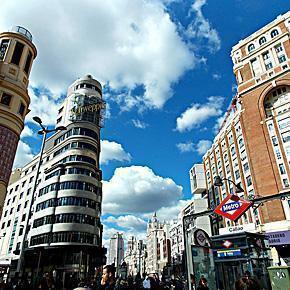 You can also catch a show or a movie, or just linger in a café and enjoy the spectacle that is Madrid. The next morning, get up at a decent hour and take the metro to the Rastro Flea Market, to experience one of the best I have ever experienced. It is said to be the largest market in Europe with its 3500+ stalls. The Rastro district is a very old part of Madrid and its medieval charm remains today, with small squares, aged buildings and antique shops. Before it gets too late, take the metro to the Delicias station. 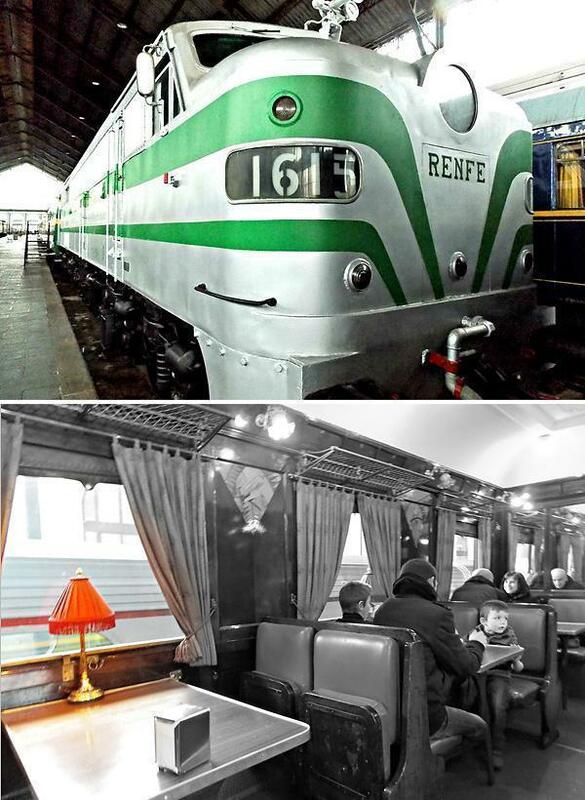 Then make the short walk to the Museo del Ferrocarril, the railway museum. This museum is absolutely fantastic and one of my favorite places in the capital. 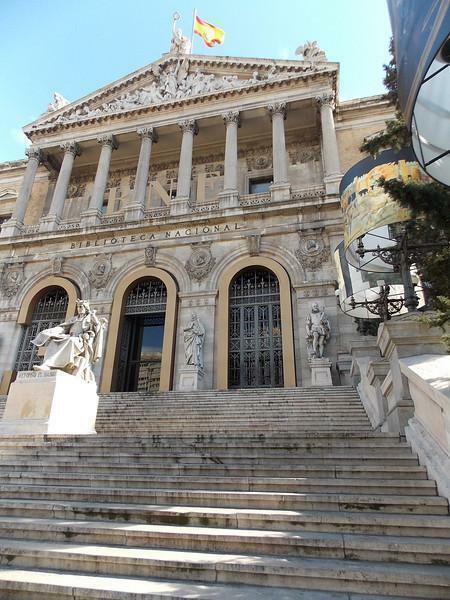 One much overlooked building, worth a visit, is the National Library of Spain. Personally, the outside is more impressive than the inside, where there is always an exhibition or two going on, as well as a small gift shop. Entry to the library is free, but visitors can only access the downstairs. 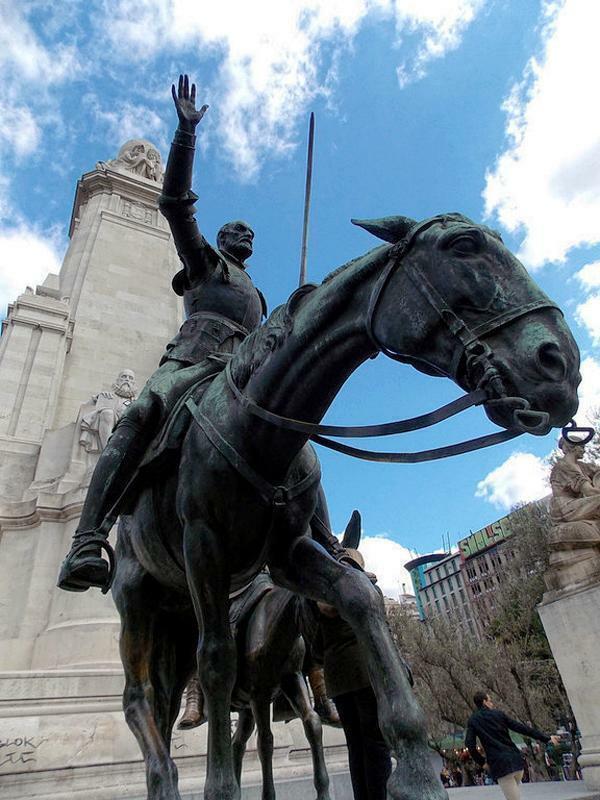 Outside this neo-classical building, the Spanish celebrate their writers and men of letters with some very large statues, including the darling of Spanish literature, Miguel Cervantes. What I admired most, however, were the lamp shades on the lights, outside of the library. This was my first experience with outdoor lamp shades! Obviously a weekend is simply not enough time to enjoy Madrid, but it will give you a taste of the city, both on your palate and in your heart. All photos in this post are copyright Michael Adubato. 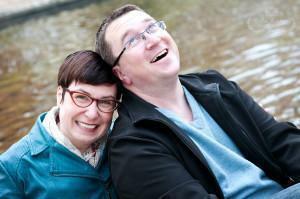 Michael Adubato is a writing, traveling soccer fanatic who moved to Belgium during the last millennium. He can often be found at the Stade Charles Tondreau, the home of RAEC Mons professional soccer team in his adopted home town, at the Stade Constant Vanden Stock in Brussels, covering American soccer player Sacha Kljestan and Anderlecht for the website Yanks Abroad or hidden away in a café somewhere plugging away at his book on Belgium and Belgian soccer that should be out this summer.